In case you need a refresher on asymmetric cryptography, have a look at last week's entry. With MariaDB / MySQL, you have to step up to the paid enterprise version to get public key crypto in your database (please let me know if I am wrong on this). PostgreSQL has this functionality freely available, so we will use it for our demonstration. Postgresql-contrib is a collection of extensions to postgres that provide some useful functionality. We need one in particular: pgcrypto. Pgcrypto provides crypto functions for postgres. You will also need plpython installed. Plpython is the Python procedural language for Postgres. In CentOS / RHEL / Fedora, you will need to install postgresql-plpython. rngd feeds random data into the kernel's entropy pool where gpg is trying to get entropy from. -r tells rngd to use the device we specify as the source of randomness (we will use /dev/urandom in this case). -a tells GPG to "armor" the keys which essentially Base64 encodes the keys so that they can be more easily transported. Substitute your key ID (in our case, it is 7B470FB0). We need to protect the private key so only users in the postgres group can access them. We will put them in the postgres user's home directory (/var/lib/pgsql). chcon changes the security context on a specified file. As I mentioned last week, key storage is a tough problem and one that should be considered carefully. 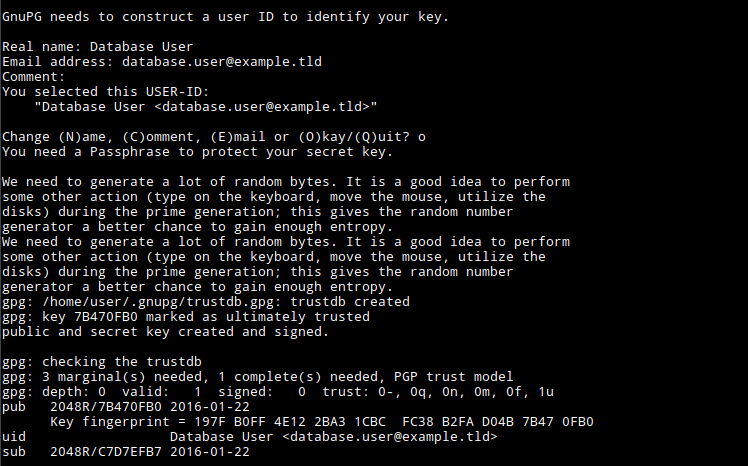 For this example, we will keep the key in the postgres user's home directory (/var/lib/pgsql). However, if this machine or that user is compromised, the key will be compromised. It would be best to keep the key on a separate machine or a key server. We are done generating keys, and now we can work on the database. I have already set up a database called example and a database user called dbuser. 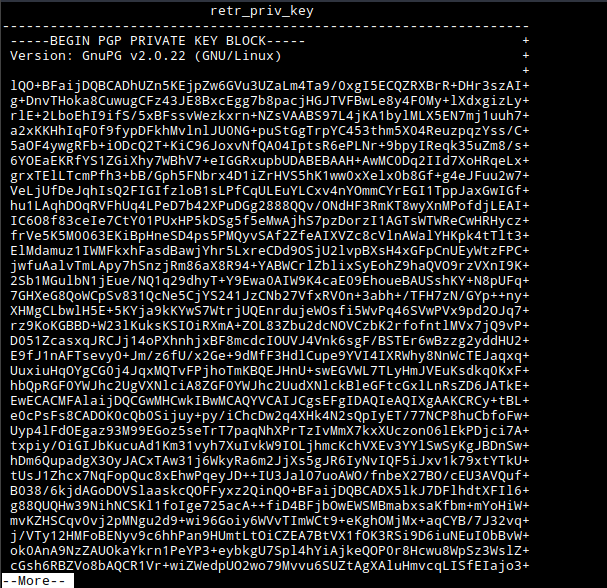 This will install the pgcrypto extension into the database. The documentation for pgcrypto is here. We will be using pgp_pub_encrypt and pgp_pub_decrypt. These functions take the respective keys (public for encrypt, secret for decrypt), so the logs will show our keys if we use them. That is fine for the public key since it is public, but we need to protect the private key somehow. We will do this by writing a function that reads the key we need and presents it in a format we can use. In the logs, it will only show that we called the function (the content of the key will not be in there). That last line (REVOKE...) makes it so that other users cannot do anything with the function. SECURITY DEFINER tells postgres that we want the function to execute with the permissions of the user that created it (as if you set the suid bit in Linux). We want to do this because the function needs to call retr_pub_key or retr_priv_key which we only allow the postgres (superuser) to run. Great. Now we should test the functions to see if they work as intended. Looks like that works as intended. This means that only the super user can retrieve the keys. That is really all there is to it. 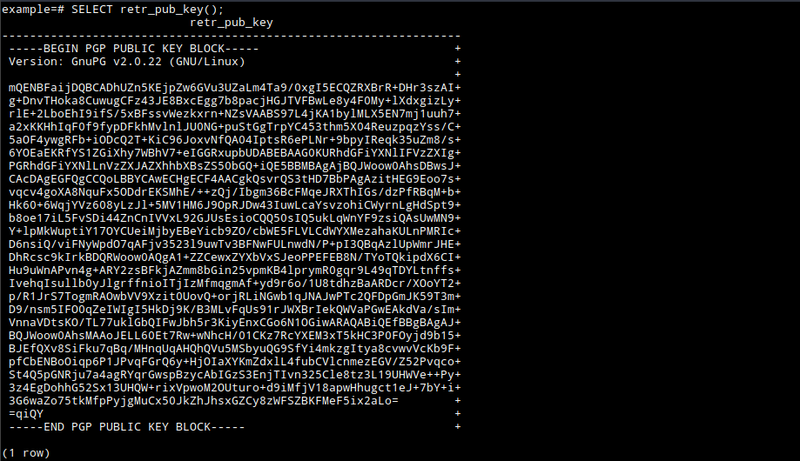 Key storage is still an issue here, but this is an alternative to using symmetric crypto that we used last week. Please let me know what you think. Did I gloss over something you think needed more explanation? Is there a better way to do this?